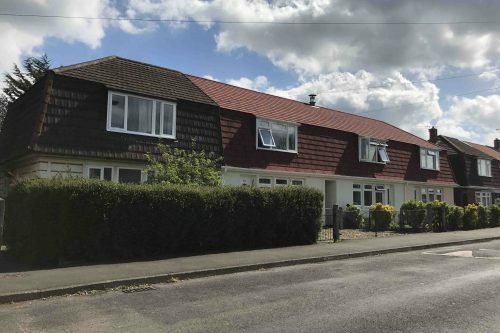 Metrotile Lightweight Roofing has been utilised for a refurbishment project by Homes in Sedgemoor, an Arms Length Management Organisation (ALMO) that manages over 4000 properties owned by Sedgemoor District Council. In this case, the refurbished properties are Cornish Units located on various roads within the Sydenham Estate area in Bridgwater, Somerset. Cornish Units – also known by many as ‘prefabs’ – were initially built as a short term solution to the post-war housing crisis and were not expected to survive the many decades that they have remained in place. Part of the reason they have endured is due to extensive refurbishment programs carried out over the years by the Local Authorities and Housing Associations that hold Cornish Units as part of their housing stock. Metrotile Shingle mansard roof as part of the external envelope. For more information about Homes in Sedgemoor, visit their website: www.homesinsedgemoor.org. For more information about Metrotile Lightweight Roofing, you can contact us.